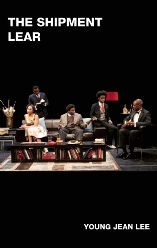 In The Shipment, Lee provides a provocative look at African-American identity in our not-yet post-racial society. The New York Times calls this take on cultural images of black America “a subversive, seriously funny new theater piece… Ms. Lee wields sharp, offbeat humor to point up the clichés, distortions and absurdities” (Charles Isherwood, New York Times). LEAR is Lee’s own version of Shakespeare’s tragedy, focusing on the king’s three daughters. A production in which Lear himself never appears, LEAR is a “wacky blend of ‘To be or not to be,’ Beckett, and Pirandello…full of exhilarating, illuminating moments” (Village Voice). Young Jean Lee has written and directed shows in New York with Young Jean Lee’s Theater Company and toured her work to over twenty cities around the world. Her plays include Straight White Men, We’re Gonna Die, Untitled Feminist Show, The Shipment, Lear and Songs of the Dragons Flying to Heaven. Awards include two Obies, the Festival Prize of the Zuercher Theater Spektakel, a Prize in Literature from the American Academy of Arts and Letters, a Guggenheim Fellowship and a Doris Duke Artist Award.